Preview the Next Volume of Luther's Works! The following excerpts from the forthcoming volume of Luther's Works (Volume 68, Sermons on Matthew 18-24) highlight Luther’s approach to Matthew’s Gospel. This is the twofold birth of Christ. First, there is the birth by which He is called God’s Son. This birth is from eternity. This same one wanted to be a mother hen and was with all the prophets. Afterward He became a man, was born of Mary, and yet they are not two but only one Son. This article suffers great hardship among the fanatics. But after the Lord Christ’s ascension, people in the Christian Church believe in this way: “I believe in God the Father and in Jesus Christ, His only-begotten Son, our Lord,” etc. For Christ is another person. Although He is not the Father, He is still the Creator of heaven and earth, has the divine essence and nature, and later was also born of the Virgin Mary in time. And yet there are not two Christs or Sons, but one Jesus, as we say “and in Jesus Christ,” who is one single Son, one person, and yet has two natures, which are united in the one person and in Christ. The holy Gospels teach us this and also prove it, and if this article falters, we are lost. The Turk and sects want to get at it and will not leave the article in peace. But you say, “This is what my Creed and the Holy Scriptures teach: I believe in Jesus Christ, His only-begotten Son, who was conceived and born.” This same children’s Creed stands here and says that He existed even before the world was created—yes, before Moses existed—and now He preaches as a man who is thirty-four years old after being born by His mother, Mary, even as the other evangelists all prove and demonstrate. Therefore, pay good attention to this and similar passages, for if this article is lost, we are no longer Christians. Therefore, if we believe in this article, we are also called Christians by this article. And whoever believes in this article, believing in the Seed of the woman, as He was then before He was born, when [God] says, “I will put enmity between the woman’s Seed and your seed,” etc. [Gen. 3:15]—He was already born then. Then people believed that this Seed of the woman was to be the one who would kill the devil, even in the time when Adam lived. This is said often, and the Holy Scriptures teach it everywhere. 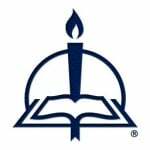 We see this in the creeds, which have been drawn from the Bible and include in a brief summary what otherwise is contained in more detail in the Holy Scriptures. Having now preached this in general, the Lord begins prophesying about the destruction of Jerusalem and the end of the world. He tells what kinds of signs will occur, and says that He has placed His kingdom right in the midst of His enemies, and wrangles with the factions and tyrants, as happened in the time of Christ and the apostles. For the devil does not rest. We should get used to this, therefore, and pay no heed to those who cry: “We had such wonderful peace under the papacy! There was even unity in doctrine,” which is a lie, since there was great doctrinal dissension. Here you should learn that there cannot be any unity in doctrine, because the devil has not been driven into hell yet. He still rules among the children of disbelief [Eph. 2:2]. After the Sacramentarians and Anabaptists, whom we have opposed, even more factions and sects will arise, even though now (praise God!) the Anabaptists and Sacramentarians have nearly been suppressed; they are not stirring very much anymore. Therefore, this applies to us, and we are told that before the Last Day comes there will be such an uproar, dissension, division, and killing in the world that people will fear losing Christ and the Gospel entirely. Yet Christ shall remain, and His Word shall be preserved. He also says that the days will be cut short for the sake of the elect [Matt. 24:22]. Now the glorious city and the entire kingdom, even the priesthood, which God Himself instituted, must go to ruin. The words are not entirely clear though. Matthew and Mark [cf. chapter 13] mention the tribulation before the end of the world along with the impending destruction of Jerusalem, while also giving indication here and there about the destruction of the world, in such a way that He mixes and mingles both together. It is also usual for the Holy Spirit to speak this way in Holy Scripture. When Adam had been created and Eve was still to be created, Holy Scripture says that God took a rib and built a woman from it [Gen. 2:21–22]. The text uses the word “build” when it could have said, “He made or created a woman from it.” It uses the word “build” as when carpenters build a house, and with this word the Holy | Spirit swiftly moves beyond that account and reveals something remarkable: that the word “build” not only describes Eve as Adam’s bride but also points simultaneously to the Christian Church, which is also God’s dwelling and temple, which God has built and continues build­ing even to the end of the world. She is the spiritual Eve, who has been taken from the side of Christ, for when His side was opened, she was taken from His flesh and blood. Adam’s rib had flesh and blood; in the same way we, the Christian Church, are also built from the side of the true Adam, Christ. This word must have meant this right from the beginning of the world. The Holy Spirit often phrases it like this. From this account He shows that, even as Eve is the true woman, made from the rib of the man, so also the Lord Christ’s Bride, the true Eve, is the Christian Church, which is also taken from Christ, just as Eve was born and built from Adam’s flesh, for that is what this meant. From Luther’s Works volume 68, pages 107–8, 250–51, 264, 277–78. © 2014 Concordia Publishing House. All rights reserved. 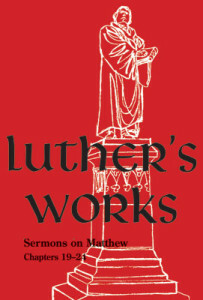 To order Luther’s Works volume 68, please contact CPH at 800-325-3040 or visit www.cph.org. This volume is part of the expansion of the American Edition of Luther’s Works. Learn more at cph.org/luthersworks.